One day before Thanksgiving and three days before its biggest game of the year, the Ohio State football team hosted about 75 children from local schools for a meal at the Woody Hayes Athletic Center. In conjunction with former Ohio State wide receiver Roy Hall’s DRIVEN Foundation and members of the Ohio State Police Department and Columbus Police Department, Ohio State’s captains – specifically defensive end Jalyn Holmes, defensive tackle Tracy Sprinkle and linebacker Chris Worley – organized Wednesday morning’s event, bringing their team and members of the community together to break bread and share a message of unity. Those in attendance at Wednesday morning’s event heard from and had the opportunity to ask questions to Holmes, Sprinkle, Worley, Columbus Police Sgt. Duane Nicholson and Ohio State Police chief Craig Stone, while other members of the team and each police department also sat at tables with the children to eat lunch and have conversations with them. 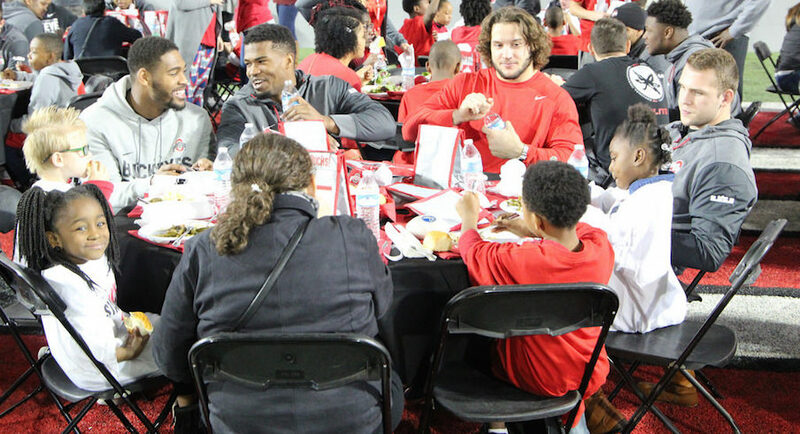 Members of the Ohio State football team, including Jonathon Cooper and Nick Bosa, eat lunch with local schoolchildren. Some members of the Buckeyes, including Worley and quarterback J.T. Barrett, also spent time playing basketball with the kids. Giving back to the community during Thanksgiving week has been a regular tradition for the Ohio State football team, and Wednesday’s event on the Buckeyes’ indoor practice field wasn’t the only community service event the team participated in on Wednesday; while many members of the team were at the event at the Woody Hayes Athletic Center, other members of the team went to LifeCare Alliance – a non-profit organization that provides health and nutrition services to older adults and people with medical challenges or disabilities in Columbus – to volunteer there. Never too busy to give back. That said, Holmes and Worley said the inspiration for the specific nature of Wednesday’s event on campus – bringing the Buckeyes, local police and children from Columbus City Schools together – came earlier this fall when many players around the NFL decided to protest by kneeling during the national anthem. While Ohio State decided not to participate in those protests, the Buckeyes felt it was important to give back to the community and do their part to try to "bridge the gap" that might be present between the police and the community. "A lot of times, with all the protests going on in the NFL and the national anthem, the message in the protests gets lost," Worley said. "Everyone makes it about the national anthem and all those things, but the real message is the community, what’s going on in the community and that’s not being talked about. So in order to skip all of those phases, we wanted to go straight to the community and get to the real problem, provide dialogue and bridge the gap." Chris Worley answers a question from a student while Tracy Sprinkle and Columbus Police Sgt. Duane Nicholson look on. Holmes and Worley said they wanted to provide a positive influence for children in the community. "I feel like it’s real important because especially getting the kids early, they won’t grow up thinking like they’re so divided," Holmes said. "When they see themselves, other police officers of different races and different football players, different coaches, different teachers, it gives them a lot of options that they can be anything they want to be in life." Hall, who works with Ohio State coach Urban Meyer and his foundation, said he has continuous conversation with Meyer and the football team throughout the year, which led to working together with the team for Wednesday morning’s event. Hall said he thought it was "absolutely awesome" that the Buckeyes took the time out of their schedules, in the middle of preparing for The Game, to spend time with members of the community on Wednesday. "This is not before the spring game. This is not after a practice. This is the week, and these guys are coming out, hanging out, it means everything to the kids," Hall said. "They’re going to go home and tell their mom about the football players they met and most importantly, the great people that serve us and protect us and many law enforcement representatives that was here today." Roy Hall speaks while Tracy Sprinkle looks on during Wednesday's event. The Buckeyes said they took just as much away from Wednesday’s event as they gave, with Holmes saying the opportunity to meet with law enforcement officers and with children from the community left him with a different perspective as well. "I never knew the training that police officers have been through and the hardships that they go through every day, so just getting to talk to police officers, different kids from the inner city, it just gives you a whole different perspective," Holmes said. At the end of the day, Holmes said the message he wanted the children to leave Wednesday’s event with was that they can overcome adversity and accomplish great things. "You can be anything you want to be in life, and your circumstances is not your final destination," Holmes said. "If you work hard and you set your mind to it, you can be anything." Urban Meyer and Ryan Stamper chat with an Ohio State Police officer before taking a group photo at Wednesday's event. Worley said he wanted the children to know that the community around them – including the Ohio State football players – want to help those who are facing challenges in their lives. "No matter what’s going on, how much adversity hits, there’s people that care about you. And in the community, this is our community, we have to be the change and a lot of times, they idolize people in their own backyard, that’s Buckeye football players, so we just want to come here and provide some hope for these guys," Worley said.